What I’m Loving : Home, Beauty and More! It’s been awhile since I’ve shared a What I’m Loving post so I thought it was about time. I usually focus 100% of these types of posts on home-related purchases and wish-list items but this time around, I feel more well-rounded. I’m actually including a few beauty products and a kitchen product that I’ve been loving. Branching out like crazy, right?! This is totally random but I’ve been loving taking better care of my skin. I’ve been using a daily mosturizer (I have a few samples of Clinque so that’s what I’ve been using). I’m looking for a good three-step program that doesn’t break the bank. Something amazing and non-smelly. I’m super sensitive to scents so it’s gotta be something that doesn’t linger. Do you have anything you love? Have you ever done a deep conditioning treatment for your hair? I bought this Argan Oil Hair Mask about a year ago and recently started using it every other week. I’m loving what it does to my hair! It makes it so soft and somehow, makes my hair less frizzy. I have two things right now and one’s expensive and one’s super cheap! But, you need them both. Trader Joe’s Kitchen Sink Dunkers. Holy cow, go buy these right now. It’s a mix between a cookie and a biscotti. Amazing dippers for your coffee, or if you like crunchy cookies like I do, then they are good anytime. Almost too good because I can’t stop eating them. An expresso machine is something I would have never thought would be on my love list but it definitely makes the list and high up on it. We got the Breville Barista Express Expresso Machine in March and we booted our coffee maker out the door. Seriously, major love for this. We make lattes daily and usually three times per day. If you’ve been considering one, we absolutely love ours. 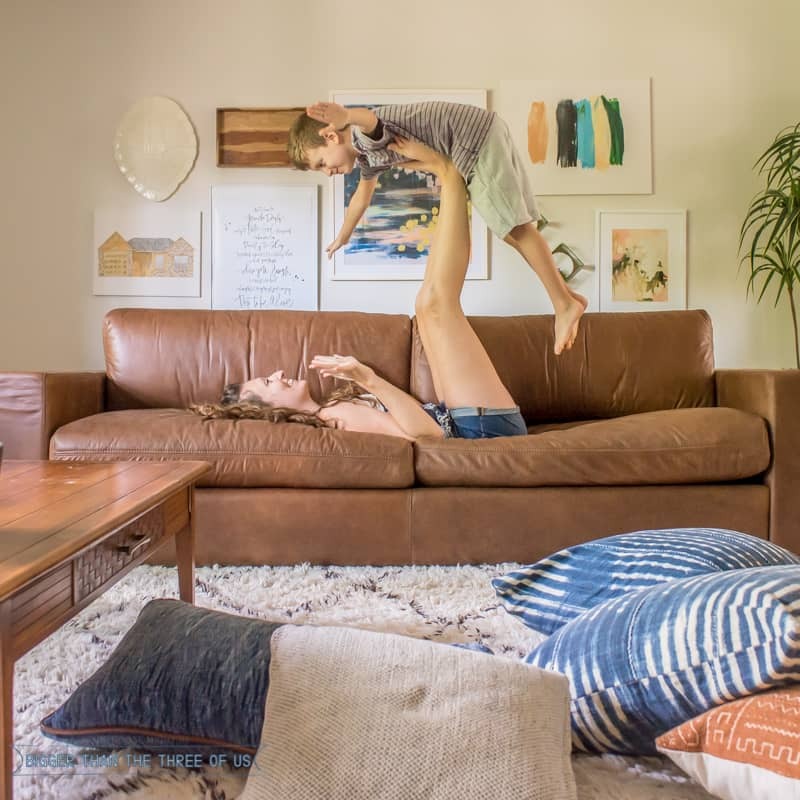 You know our new couch from Sixpenny made the list. It’s my go-to spot for relaxing in the living room. Seriously, I just adore it. Buttery soft leather and long enough for me to lounge on… I won’t tell you how many times I’ve fallen asleep in the living room this week. Ha! If you missed my most recent post on the living room and how it’s changed, make sure to check it out. We pay for lawn fertilizing maintenance. It’s something that we’ve tried to do ourselves in the first few years of living in our house. We just failed at it. We spent money on the products, read how-to’s and spent weekends trying to figure it all out. It just never looked amazing. It’s so annoying to spend money/energy on something and it just not look good. Well, our next-door neighbor recommended the guy he uses. He said that he’s been around forever and does a great job. So, we signed up and our yard gets fertilized and maintained with I don’t know what about 8x per year. Every June, I get a call and it’s the guy who owns the company. He says he’s on his way over and is going to leave gladiolus for me. He has a huge crop at his house and he cuts a truckload and delivers them every year to his clients. In chatting with him, he says it takes over six hours to cut them down and load them up. The customer service/acts of kindness with this one little thing each year really stands out to me. This may be a “midwest” thing but I just love it. Every time I look at the over-filled vases full of flowers, I just smile. Hope you all have a great weekend. Luke and I have a weekend alone. Greyson is going camping with his grandparents. I’m sure Luke hasn’t thought about what he wants to do during all our free time, but I’m thinking it’s a good time for a project! =) Now, which one should I pick? !